To the editor -- Another spring, another much anticipated migration of "Kings of the Columbia," our Pacific Northwest's most revered salmonoid, the chinook salmon. At one-time chinook and their cousins migrated upstream by the hundreds of thousands. No longer. Salmon and steelhead are on the fast track to becoming endangered species. The Columbia River has its problems when considering fish migrations. The dams, commercial transportation, irrigation demands, you name it. These problems are solvable, but it will take time. There is now one glaring problem that can be simply and quickly resolved. The invasive species called sea lion. This opportunistic, gluttonous pinniped has no business in fresh water. It's a marine mammal that kills indiscriminately. Salmon, steelhead and sturgeon populations are being decimated. 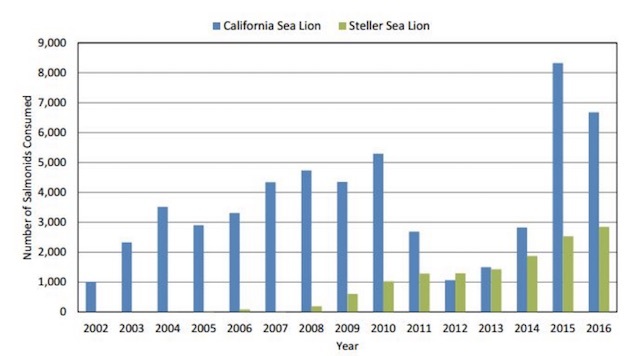 The sea lions' upriver movement, facilitated by the federal government, is ecological heresy. Federal and state bureaucracy will never solve this. The power that will is the combined strength of Washington, Oregon and Idaho's Native American tribes. Ignore the federal government. Save the resource. Any sea lion upriver of Highway 101 from Astoria to Washington must be eliminated. Do this for your culture and every sportsman who has ever had a "king" on the end of his line.